There was silence for about 2 minutes... Then the doctor bends his head low and noticed that he'd dropped a tear, that took a gentle warm walk down his cheeks. 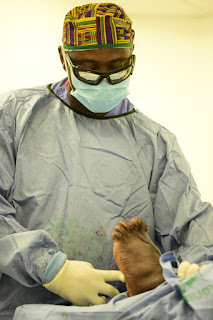 He wiped it and said: "I'm going to do my best to make you wear shoes"
Why the doctor cried, I have no idea. But from the story, we can gather that, the desire to live a better life is all that most of us yearn for. That we may come out of the difficult situations we were born in, that we may get the doors of better opportunities flung open at us, that someway, somehow, someone will lead us to our promised land. Opportunities these days, have become hard to come by, so much that the preaching has become "create opportunities for yourself". It's hardly, "there's opportunity all around you"
But however, the one thing that can keep us going is to keep hope alive. To believe that we'll make it anyway. How to keep hope alive and have faith is another battle of life altogether. I mean, how am I supposed to be able to say "I'm fine" when I'm drowning deep in the sea of disappointments, hurts and betrayals? Like where's the air to even breath in that sea? But you know what? Thank God that we have hearts with which to believe, so that when our mouths fail us, when we're plunged deep in the waters and we can't open our mouths lest the water gets inside of us, to cause us to drown more, our hearts and minds can do the proclamations and affirmations. And we'd be still to know that he alone is Lord. It's difficult to keep hope alive and to have faith when all seems lost, I know. But we can't give up. We can't disappoint ourselves after running miles as a sperm, to fertilize an egg, become a zygote, an embryo, a fetus, to be born as a baby, go through all the troubles of growing up and then just give up. We simply can't do that Cos 90 job. We must run the race to the end, it doesn't matter whether we're first or last, we must simply make it! Happy New Month! Shine forth! Keep hope and faith alive!